“The format of the Fair is a unique combination of a Historical Exhibition and Collectables Fair. The Exhibition contains over 100 different categories of collectables from private collections, providing a unique opportunity to view and buy rare and unique items from Australia’s history”. Below you can find out the display categories, limits and guidelines for the exhibition. 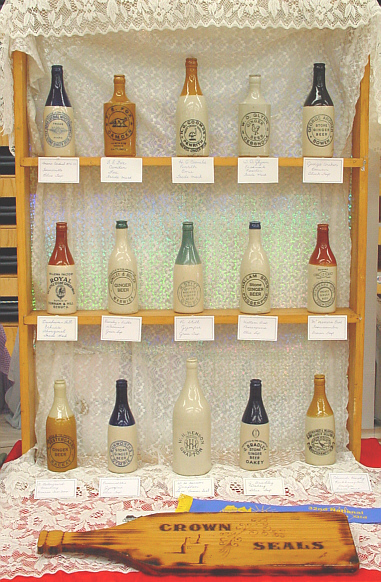 Section A is designated for Antique Bottles and specialist categories with 15 items in a display. This section also allows for displays like ‘One item with written history’ so you can show those unique cool drinks related items. 3 feet of table space is provided. If you are starting out your collection, Section B is the ideal place to compete. There is 8 items in a display. The guidelines are that you must win 2 times in B section to move up to A section. There are huge number of old and collectable items that are both attractive and provide insight into how we lived in a by-gone era. We invite private collectors to put these items on display in this section.